Prominent & Leading Manufacturer from Faridabad, we offer printed non woven bags, offset printing non woven bags and laminated non woven bag. We provide Offset Printing Non Woven Bags with suitable requirements as per client needs. These are range is designed by our proficient experts, who use premium grade raw material procured from reliable vendors. 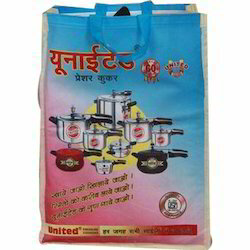 These bags at reasonable price and are available in various sizes, shapes as per client requirements. These bags are suitable for packaging dissimilar types of commodities at industrial and commercial level. Laminated Non Woven Bag is highly demanded in the markets for their superior quality and excellent service. These are manufactured using high grade quality materials and according to the international quality standards. These are available in various sizes and models and are tested on various parameters in the industry. Clients can avail these from us at reasonable prices in the market.